Dedication, originally uploaded by Ryan Wenner. Saturday I shot photos for the mountain bike race at Two Mile Run county park. A total of 93 entrants rode the very technical, 18 mile race. As if finishing it on two wheels wasn't tough enough, this guy rode the whole course on a unicycle, and finished ahead of about half of the entrants. In hindsight, I should have interviewed him after the race to get details for this blog post....but one thing I'm pretty sure of, is that it takes dedication to your sport to develop that kind of skill. 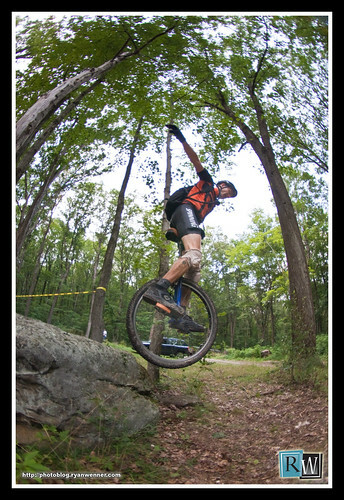 Friend and fellow photographer, Michael Henderson, has a YouTube video of the unicyclist tackling the same obstacle. As promised, here's a slideshow of some of my random shots from the 2010 Oil Heritage Festival parade and concerts in the park. There are a few left that I'll be posting to the blog individually in the coming days. My favorites get a little more attention in photoshop. This is a slideshow of the raft race from the 2010 Oil Heritage Festival in Oil City, pa. As I get time this week, I'll be putting more of my photos from the festival online. When I created this blog, I intended to only post one or two "favorites" of mine at a time....but sometimes the things I shoot need to be experienced as a full set of photos. Also, one of the side effects of shooting photos in the small community I grew up in, is that when I get out and shoot photos at these festivals where half the town is present, I not only know half of the town, but they tend to end up in my photos. Consequently I get lots of requests to share the photos I've taken. You can view this gallery directly in the Flickr set too.